Chinese state media and netizens have criticised high pollution levels in the northeast city of Shenyang, which activists have said could be the "worst ever" air quality seen in the country. 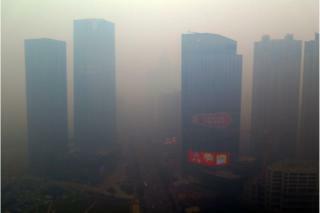 State media have blamed the local government for the thick smog. Pollution is a perennial problem in China's northeast, home to heavy industries including coal mining. In some parts of Shenyang, Sunday's readings of tiny particulate which can get into the lungs, known as PM 2.5, exceeded 1,400 micrograms per cubic metre, according to state media People's Daily. The WHO recommends a maximum 24-hour average of 25 mg per cubic metre. "As far as we are aware from the data we have been observing over the past few years, this is the highest ever PM 2.5 level recording" in the country, Dong Liansai a campaigner with environmental group Greenpeace, told AFP news agency. There has been no government confirmation of this assertion. The deterioration in air quality came as the city's coal-powered heating system fired up for the winter. Local media reported delays in the enacting of emergency measures, such as warnings to the public and issuance of stop-work orders to work sites. A Global Times editorial blamed local officials for inexperience in tackling pollution and "inconsistent channels of communication". It also blamed "unreasonable modes of energy consumption and [the] industrial structure". But it also called for public understanding saying that in general, local governments "are still on a learning curve". On the microblogging platform Weibo, Shenyang residents have continued to post pictures of themselves wearing masks and of the city plunged in a hazy gloom, using the hashtag #Shenyang Haze#, as the pollution persisted. "I can't go on living like this, #Shenyang Haze#, if this goes on any longer everyone will probably get cancer," complained user BLS-Christine on Tuesday. Earlier this year China's environment ministry announced that only eight out of the country's 74 biggest cities had passed the government's basic air quality standards in 2014. Most of the cities found to have the worst air were in the northeast of the country. China is attempting to cut pollution but still relies heavily on coal for its energy and industrial needs.